These benches tell a story – of the people who’ve come and gone, the talented hands of the person who made them, their silent watch over time passing by. 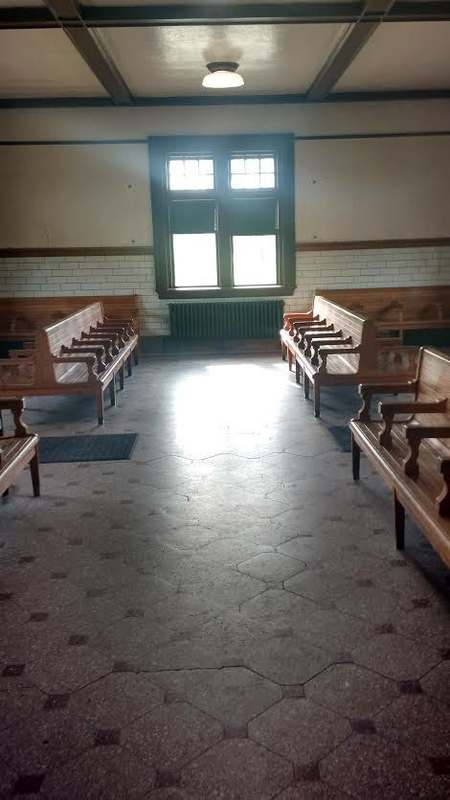 This reminds me of Ellis Island, or a train station – some place from the past, where life passed through and time has passed by. Passengers streamed off the train, waving at their loved ones. Reunions took place on the platform — kisses and hugs, handshakes and hellos, chaos and commotion. Sarah waited patiently. He’d be on the train. Watching the joy on the faces around her, she smiled to herself. A mother greeted her returning soldier with tears of joy. Sarah felt her own eyes well up. So much joy. After the rush, she made her way to the luggage car where a black draped coffin waited on a cart. She let her tears fall silently then. Her love was home at last. This is heartbreakingly sad… yet maybe better than for those who never got an answer… war is terrible. Thanks, Bjorn. It is sad – and all too common. Thanks, Bjorn. War is always sad and fallen soldiers tug at our heartstrings. It was going to be happy, but my first inclination was this and I had to go with it. This is heartbreaking — and for too many, too true. But this, this is weepy! Yes, it was a sad one this week! Thank you for reading. Love and loss go hand in hand for most of us. Thanks for commenting! Such a sucker punch, Erin; beautifully told. Thanks, Dawn. It was a perfect setting for that kind of twist. So sad. Beautiful story, very emotional. At least she can find closure. Yes, closure helps, even in the face of loss. Thanks, Sandra. I thought about making it a happy ending, but this is what I came up with first. Powerfully sad and poignantly told. Change the scene to an aeroporte and I’ve been there too many times. I’m so sorry that you have had that experience. It’s never easy to deal with real loss. Very true about the stories those benches could tell. This is a very emotional piece, heartbreaking and sad, yet with closure–something many families never get. She has already reached a loving acceptance of the situation, in that she can smile at the happy reunions. You went straight for the heart with this one. Mission accomplished. You made me cry.